At least that’s what top executives are saying about their 2014 marketing strategy. 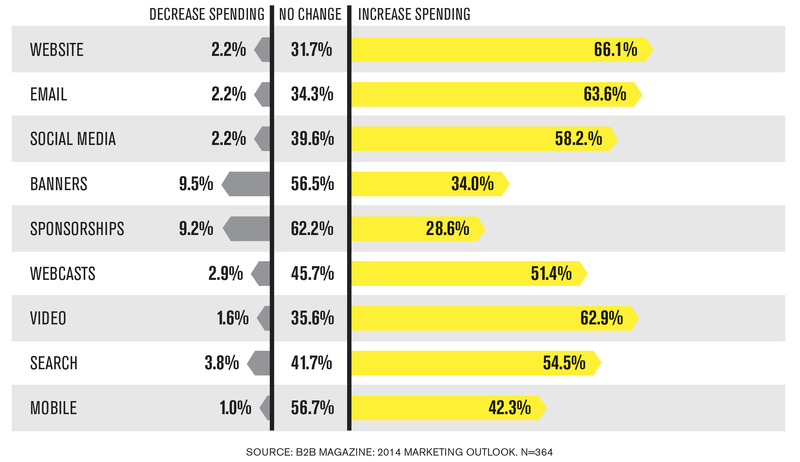 In new study released by Ad Age, digital spending is ramping up! Plan to see a huge digital push from brands of all shapes and sizes. It’s halfway through the year, what is your digital strategy? If you’re not sure, you’re already falling behind. Based on this insightful study, we’re going to see 24% (the majority) of companies spending 50%-75% of their marketing budget on pure digital. In 2013, only 16.9% companies were brave enough to commit to this investment. Looks like something is working. Right? Let’s dive into this year’s priorities of brands worldwide. 2014 into 2015 (and beyond) will bring ample opportunities to push your brand to the front of the pack. If you want to get there, you need the data, the drive and an experienced team. The process of growing your online presence should not be taken lightly. No matter where you’re located, a full circle, digital strategy, and digital audit makes impact and revs up ROI. Here in Wilmington, NC, we love the beach! When we Google “beach restaurants,” we’re faced with a plethora of options. However, if we already knew, via social media, online engagement, reputation and an awesome website…you’ve taken out the consumer guesswork, and life is just beachy. It works, and the data doesn’t lie. Does your local market know your brand? What about globally? Talk to your neighbors once and a while and they’ll stick around! Are you chiming in on local events, reviews and conversations? New Google research says that 50 percent of mobile users are most likely to visit after conducting a local search, while 34 percent of consumers on tablets or computers will go to a store. And Google says these people are ready to buy once they are in a store, as 18 percent of local searches lead to sales, compared to 7 percent for non-local searches. Blog, participate and grow exposure online, and your global footprint will take off, too. Evaluate your brand reach, and focus some time and resources to make sure you’re locally loved & respected; yet recognized on a global scale. Are you keeping up with trending marketing strategies? The landscape of digital is ever changing! Whether it’s BIG news, or minor tweaks—it’s a lot to keep up with. Your digital marketing agency should have the pulse on all opportunities and challenges for your specific business. Not all trends are solutions, and not every tool gets the job done. Are you fueling your relationships with social media, content and email marketing? The digital space is fluid and potentially combustible…so is fuel. Yet, we all still need it. There is a rising blurriness across acquisition and retention marketing. Using social media, email and content marketing, you can simultaneously acquire new customers and impress existing clients and influencers. For example, a concise blog that illustrates thought leadership of consumer issues, will impress both audiences. Set yourself up for success with digital by being smart and social in your relevant digital space. Are you generating qualified leads from your online presence? There are 3 core components to power more solid, targeted leads. Search Engine Optimization – Most b-to-b marketers are planning to spend 55% MORE on their SEO this year. Careful targeting and search strategies attract more qualified traffic to relevant content on your site. Messaging/Content – If you’re not speaking the language of potential clients, why should they listen? Providing useful, juicy, insightful (and genuine) content is tempting, shareable and engaging. User Experience – Your website should be smart, just like you. Design should be appealing, mobile optimized and the content needs to be easily accessible. Are you actually being social? Social media has one, not-so-secret ingredient… authenticity. Learning how to be authentic with your social brand takes work and social listening. Don’t Do Social, Be Social! —and they’re all Important! Whether you are a brand, company, or corporate executive, harnessing the potential of Digital opportunities will increase your visibility and create opportunities for you that you may not have otherwise had. Seize that opportunity and don’t forget to follow us in our social spaces!